Every Salute Military Golf Association member has a story behind their injury. During their tours of duty, each Warrior Golfer experienced their share of suffering and faced situations incomprehensible to a normal citizen. The mere fact that they have survived their mental and physical afflictions and continued to live their lives is a triumph in itself. They carry on each day for their brothers and sisters-in-arms who weren’t as lucky. Staff Sgt. Jack Schumacher counts himself as one of the most fortunate ones. Schumacher, a two-time recipient of the Purple Heart and the Bronze Star, lost his right leg to a rocket-propelled grenade in Afghanistan in 2009. Ever the optimist, he has found a way to see his amputation as a blessing. “When people look at me or other soldiers, the first thought you get is, ‘Oh s—, that’s very unfortunate,’” Schumacher said, referring to wounded veterans like him. “And it is a struggle, but — and I don’t say it facetiously — getting injured was easily one of the best things that’s ever happened to me. During his time at Walter Reed in Washington, he had the unwavering support of his doctors, nurses, physical therapists, and fellow veterans, at least when they were available. Most staff members only worked there Monday through Friday, so Schumacher dreaded the weekends. The loneliness and lack of regimen on Saturdays and Sundays made him feel numb. Enter the SMGA. A fellow amputee asked Schumacher to join him at an SMGA Warrior Golf Clinics one Saturday. Though Schumacher had no background in the game and knew it only as a “sport for old guys,” he tagged along. Schumacher continued to attend the weekend clinics until he was discharged from Walter Reed and his new life began. He started attending Georgetown’s McDonough School of Business, graduated, found a job with Under Armour, and got engaged. He finally picked up the game again in 2015 at the behest of his father, because Schumacher’s then-fiancee, Jill, wanted to have the wedding in Scotland. So, possibly for the first time since the invention of the game itself, someone — that being Schumacher — played their first 18 holes at none other than the home of golf, the Old Course at St. Andrews. 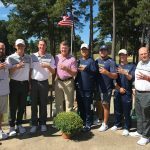 Schumacher’s time with the SMGA has also led him to foster a relationship with the George Washington Men’s Golf Team. He spent a day with the players in the fall of 2015, sharing his story and learning theirs. He came away impressed by their interest in service. He also made a connection with then-sophomore Jack Porcelli. Porcelli and Schumacher spend time together at SMGA events, text regularly, and Porcelli keeps Schumacher’s American flag patch with him at all times. When it came time to decide who would carry the Warrior Tribute bag in honor of Schumacher at VCU’s Janney Invitational, there was no question Porcelli was the man for the job. He wasn’t just carrying for Schumacher, however. Schumacher sent the team two personal articles to affix to the bag: his 25th Infantry Division unit patch, and Spc. John Borbonus’ name patch. Borbonus and Schumacher went through every part of their military instruction together, from basic training to Airborne school, and ended up in the same company during Schumacher’s first tour in Iraq. On April 12, 2007, their unit occupied a building in hostile territory and took on a counter-attack. Borbonus was manning a machine gun on the roof when he spotted a dump truck packed with explosives heading for the building full tilt. He managed to neutralize the driver before the truck could crash into the building, but the attackers detonated the truck remotely, causing the building to collapse with John on it. Though medics managed to resuscitate him after his unit pulled him out of the rubble, he did not survive the injuries he sustained in the explosion. His actions saved the lives of 13 soldiers, including Schumacher, and earned him a Silver Star. Schumacher lives each day in memory of Borbonus. Schumacher will continue to help other wounded veterans with their rehabilitation and share his and Borbonus’ stories with the world, because Borbonus gave him that chance. 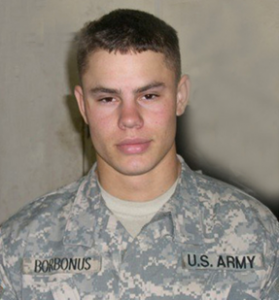 That’s what he does to honor Borbonus as well as every other soldier who gave their life: live as passionately and fully as he can. “Giving the ultimate sacrifice is something that needs to be treated with the utmost respect,” he said. “I think the best thing that can be conducive to that is telling their stories, finding out more about them, listening to what they meant for their units, to their country, because that’s really where their legacy lives on.